This is not particularly surprising. Personally, I don’t find the tabbed interface useful at all–it just means I have to look in more places to finish reading through my inbox. If I do run short of time, it is the promotions tab that suffers. 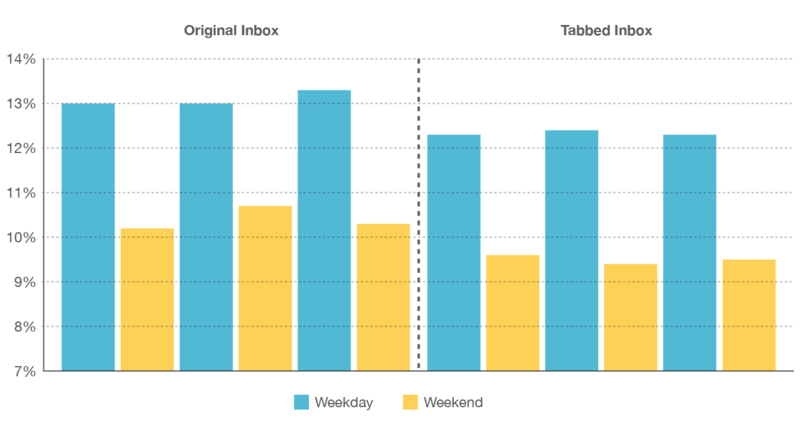 The MailChimp folks say that it is very hard to write email that doesn’t get stuffed into the promotions tab too. What a pity Google didn’t put Google Reader on a tab instead of Promotions and Social. It wouldn’t been a lot more useful, but that’s beating a dead horse. It’s in Google’s best interest to kill or damage any marketing channels they don’t own. They don’t really help in any way with email marketing, so anything they can do to reduce its efficacy means you’re that much more likely to shift dollars to areas they do own. They get nothing when your successful SEO leads to lots of results through good organic search results so they’re only to happy to limit the information you can get about how people found your site and thereby make your SEO that much less effective. In fact, they’ve basically declared all out war on SEO’s. They are the enemy because they reduce your need to spend ad dollars with Google. Expect more of this as time goes on. Big companies can’t resist using their clout to do this kind of Evil. In the original PC days, the Evil was perpetrated by controlling shelf space. If you owned all the shelf space, nobody would ever see the Little Guy’s innovative new products. In today’s world, they want your eyeballs focused entirely on parts of the Internet that contain their ads. As their growth and profitability slow down, they’re only going to play these kinds of games more often to try to prop things up. One of the questions every SaaS company will have to be able to answer for their customers is, “What happens if you go under?” It’s actually a fascinating question, and one you have a chance as a vendor to think about and turn to your advantage. For example, one of my SaaS ventures was Helpstream. We had the unpleasant experience of being shut down by our VC’s shortly after the 2008 crash, but we tried to do well by our customers. As it turned out, our architecture made it very straightforward for us to offer those folks the chance to host their own Helpstream instance and keep going rather than have to stop cold turkey. There are still customers live on the software as a result. I won’t go into all the details of how this was accomplished, but suffice it to say our architecture made us very nimble about being able to create multi-tenant apartment complexes that could house anywhere from 1 to a couple of thousand tenants on standard Amazon EC2 + S3 infrastructure. Thus it was trivial for us to set up a customer as their own tenant in their own apartment house and hand them the keys. This is not something you could say about something like, say, Salesforce.com, or many other SaaS offerings. Building on a commodity cloud like Amazon can have its virtues. In the perpetual on-premises license days, we had source code escrows. In the SaaS/Cloud era, it makes sense to codify what happens in the event of a dissolution of some sort. As the Helpstream example shows, it’s possible to do something that makes enormous sense for customers and thereby give them a greater sense of security, something that the Cloud is not often known for. Unfortunately, things also go on in the Cloud that have nothing to do with a particular vendor, but that actually make things much worse for customers. I present the example of Feedly and the Apple App Store. As most of you will know, Google discontinued Google Reader, forcing those of us who need such a thing to seek alternatives. I looked at a good half dozen during the warning period and eventually settled on Feedly. Let me be clear that this is still not a decision I regret, but I am forced to endure a not so pleasant aspect of the way Feedly works on my iPad. There is a problem in that Feedly is set up to seamlessly transfer you from Google Reader to Feedly. That part is good. What is less good is that Google changed some aspects of the API and created a little problem for the Feedly app. Feedly works great for me on my desktop, because I can access it via web browser as a thin client. It is dead to me on my iPad because of this problem. 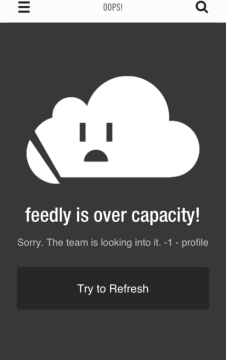 Feedly mistakenly thinks it is overloaded with users, a surprisingly plausible story in the wake of Google Reader shutting down. In fact, this is not the case. There is simply a bug that causes the iOS Feedly app to mistakenly report this problem. Since iOS is a walled garden, and Feedly has to wait until Apple approves a fixed version of the app, they are stuck. It’s been 7 days and the app still doesn’t work and a fix has not been approved. As my headline says, the map is buried with the treasure because Apple is presenting them from fixing a very obvious problem. Feedly has no real answer for this, and Apple isn’t telling them an ETA on approval either. It’s hard to be impressed with either Apple or Feedly based on how all of this is rolling out. You’d think whatever process Apple uses would be aware of how many people use Feedly (it’s millions) and could find a way to expedite an obvious fix. Apparently the Monarchy of Cupertino cannot be bothered with such mundane details as customer happiness. Meanwhile, I have to ask myself, “Why can’t I run the Feedly thin client in the Safari browser on iOS?” That would be so handy right about now. Yet, they seem to have been at pains to ensure that if you are on an iPad, you surely must use their app and are to be prevented from accessing the thin client that works so well on my desktop and that would have prevented this nuisance. Folks, the next time you’re using your tablet and you go to some website and it offers to download an app, skip it. That app is not going to improve your user experience enough to be worth the trouble. You are only going to encourage them not to keep their thin client working well on your platform. And someday, you may wish the map hadn’t been buried with the treasure the way the Feedly guys did it. Don’t frequent the Walled Garden. Don’t encourage it at all unless you absolutely must. This was all tragically avoidable, and I hope Feedly will take note and pave the way for their thin client to work on iOS so the next time they don’t have to wait on Apple. Those of you at other companies, don’t let this happen to your customers!